I wrote an article once titled: Lies, Damned lies, and Palestinian Propaganda in Descending Order. That title paraphrased British Prime Minister, Benjamin Disraeli's 19th century aphorism: Lies, damned lies, and statistics in descending order. Few have mastered the art of dissimilitude more than long time Palestinian Arab spokesman, Saeb Erakat, who continues to be taken seriously by the ever gullible western media. Now in his late middle age, Erakat continues to spew howlers as he has been doing for several decades, yet he still retains the confidence of mainstream western journalists and reporters — especially those of the Left. So, true to form, Erakat chose The Guardian newspaper, one of Britain's most left leaning and anti-Israel dailies to let fly another howler. According to Erakat's recent Op-Ed in The Guardian, there are now seven million Palestinian Arab refugees. This is seven times the number of Arabs who foolishly left their homes in 1948 when ordered to do so by the corrupt Arab League, while at the same time seven Arab armies were invading the fledgling and re-born Jewish state with the intention of committing genocide against its Jewish citizens. Incidentally, 850,000 Jewish refugees were systematically driven from their homes throughout the Arab world. Most found refuge in Israel. And the 200,000 Arabs (including some 100,000 who were later allowed by Israel to return) who ignored their leaders and remained in Israel now number 1.2 million; some 20% of the Jewish state's population. But Erakat would never mention those facts. The Arab leaders who call themselves Palestinians often accuse Israel of committing a "holocaust" against the Palestinian Arabs. At the same time, they inflate the numbers of these same Arabs in an almost precipitous and distorted bell curve. If only the Jewish victims of the real Holocaust would have suffered in such a fashion, there would not have been six million dead but — using Erakat's bizarre mathematics — forty million additional Jewish souls alive today. That is the extent of the lies, damned lies, and statistics that people like Erakat routinely spew. The tragedy is that so many in the West are ever willing to swallow such garbage. But let's look at Erakat's career as a propagandist. This is the man who bamboozled the world on CNN in April 2002 by baldly stating that Israel had, "massacred at least 500 people in Jenin and that women and children were missing." This outrageous lie was effectively dismissed by Colin Powell himself and its falsehood subsequently confirmed by the UN, which went on to report that 56 Arabs were killed (34 of them armed combatants) in fighting by the IDF against Palestinian Arab terror squads infesting the Arab city. This is the city from which some 28 suicide bombers had infiltrated the Jewish state, perpetrating atrocities against hundreds of Israeli civilians during the previous 18 months. Erakat knew his words were false, but he also knew the effectiveness of the "big lie." No Arab civilians were missing. However, many of the 22 civilians killed were used as human shields by the Arab terrorists — in itself an Arab war crime that remains unpunished. Erakat's outright lie was hardly challenged, nor his credibility dented. After all, he has made a perverse career of half-truths, mistruths and spectacular falsehoods over several decades while acting as a Palestinian spokesman and negotiator in what is called the, "peace process." In the latest round of indirect talks between the Israelis and the Palestinian Arabs, brokered by George Mitchell at the behest of his master in the White House, Barack Hussein Obama, Erakat is again, front and center, obfuscating and manipulating the clueless media in the way he knows best. In an article by Bret Stephens titled Liar, liar in December 2002, published in the Jerusalem Post, it was pointed out that up to that date, "Erakat has had no less than 11,382 citations in the English language press since 1988" — a veritable Niagara Falls of falsehoods that have done so much to poison the minds of countless readers against Israel. Since then the torrent of Erakat whoppers has washed away any sense of historical accuracy. In the International Herald Tribune (11/26/05), Saeb Erekat wrote, "Israel is a nuclear power boasting the fifth-largest military in the world." Correction (1/3/06): "While there are various ways to measure military strength, in terms of manpower alone and counting both active service members and reservists, Israel's military ranks 18th globally, according to data in the latest edition of "The Military Balance," a reference by the International Institute for Strategic Studies." Erakat has often claimed to the Western world and through its media that, "Palestinians are committed to two equal states for two peoples." Sounds nice to western ears, but facts tell a very different story. Well over 60% of Arabs calling themselves Palestinians reject outright such an Erakat claim. And Mahmoud Abbas himself, the Chairman of the Palestinian Authority, rejects utterly any willingness to accept Israel as a Jewish state. Erakat can provide no evidence that he or his cronies seek peace, while Israel can show three peace offers in the past decade. But, according to the current Palestinian narrative and effectively conveyed by Erakat, the fault for the absence of negotiations or peace lies with Israel. Erakat claims repeatedly that Israeli villages in Judea and Samaria, which Erakat describes in the anti-Israel nomenclature as "settlements in the West Bank," cover 42% of the disputed territory when in fact they control barely 5% of the ancestral and biblical Jewish heartland. Bret Stephens pointed out in his December, 2002 article that, Erakat says "settlers" are stealing Palestinian water resources. Yet almost all "settlers" are linked to the central Israeli water grid and do not use local wells." What is fact is that the Arabs pollute the scant water resources and aquifer within Judea and Samaria and the very term, Palestinian water resources, is to implicitly pre-judge whose land it truly is. He also mentioned that, "Erekat says Israel plans to deprive Palestinians of everything but "an insignificant presence in Jerusalem." Yet at Camp David, much of east Jerusalem was theirs for the taking. They refused it." Hitler's propaganda minister, Josef Goebbels, proved that telling a big lie over and over again ensured that most people would come to believe it. However, Saeb Erakat also proves that if you tell a multitude of small lies over and over again, a multitude of people will believe them without question. Erakat's career has been just such a monument to dissimilitude. Sadly, there are many people anxious and willing to accept any nonsense uttered by such a master of deceits. According to Israel National News, Saeb Erakat has criticized Prime Minister Binyamin Netanyahu for mentioning the Jewish people's historic ties to Jerusalem as described in the Bible. He accused the prime minister of, "using religion to incite hatred and fear." Biblical references it seems are now considered hate mongering by the Islamic world. The Holy Jewish Bible refers to Jerusalem and Zion, which are synonymous, 850 times. The Holy Christian Bible refers to them some 154 times. The Holy Koran does not refer to Jerusalem at all. Instead the Koran commands Muslims to: "... fight and kill the disbelievers wherever you find them, take them captive, harass them, lie in wait and ambush them using every stratagem of war." Koran 9:5. Propaganda is a stratagem of war and Mr. Erakat knows all too well how to wage it. Erakat has often sought to dismiss the inextricable 3,000 year old Jewish ties to Jerusalem and has claimed that Jewish heritage on the Temple Mount, the site of the two ancient Jewish Temples, are a threat to Islam. The neighborhoods illegally occupied by the Jordanian regime from 1948 to 1967 are now claimed by the Palestinian Authority as the future capital of a PA state. They include the Old City, the City of David and the Temple Mount. But Jewish residents of these very neighborhoods were expelled from them by the British officered Jordanian Arab Legion in 1948. 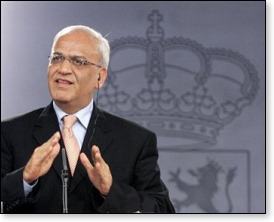 Erakat has stated several times that, "East Jerusalem cannot continue to be occupied if there is to be peace." This too will be believed by many in the international corridors of power and the media, even as they know in their heart of hearts that if Jerusalem was again divided — like Berlin once was — there still will never be peace from the Arabs. Saeb Erakat will continue to obfuscate and dissemble in his inimitable fashion, ever hiding the empirical fact that the Muslim world will never accept a Jewish state however much of its biblical and ancestral patrimony it gives away in pursuit of peace. Erakat well knows that even if Israel shrank to one downtown city block in Tel Aviv its existence would still be a provocation to the Arabs who call themselves Palestinians. The one truth that Erakat will always hide is that the Palestinian Arab leadership will never accept a "two state solution." They want no Jewish state side by side with their Arab and Muslim state. Indeed, they ultimately want one state stretching from the Mediterranean Sea to the borders of Iraq — that is an Islamic state, including the present day Kingdom of Jordan, in which neither Jews nor Hashemites will be permitted to remain. This entity will inevitably become a Hamas controlled state willingly tied to the baleful influence of the Islamic Republic of Iran — an extension of Islamist and jihadist influence on the very doorstep of Europe and a bridgehead for the dreamed of worldwide Islamic Caliphate.